building an interactive map of 100% renewable energy-related projects and goals around the world. publishing relevant news and editorials. 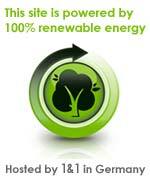 announcing 100% renewable energy related events. providing educational tools, like a library of 100% renewable energy related studies, book and film tips, and videos. catalyzing a virtual discussion where the Go 100% community can help develop best practices, forge partnerships, and build strength in numbers. The conventional energy system has led to multiple convergent existential crises. These include climate change, air and water pollution, destruction of the oceans, the threat of mass extinction, water and food shortages, energy poverty, nuclear waste pile up, nuclear weapons proliferation, fuel depletion, and geopolitical tension. If we do not change this energy system to a sustainable one based on conservation, efficiency, load management, and ecologically sustainable forms of renewable energy in the near future, humankind risks diminished planetary habitability for many generations. Gloom and despair are not healthy options. Focusing on solutions is.